We require a non – refundable deposit of 50% at the time that you accept our quotation. We cannot book production time or begin work until we have received your deposit. Upon receipt of your 50% we will prepare any artwork within two weeks from the payment of your deposit and at this stage we require your chosen wording as any changes later will incur setting charges. Once we have received written approval of the artwork, and your instructions to print we require full payment including postage and packing. Items will not leave our studio until funds have cleared into our bank account. Prices are subject to change without notice. Any price increase will not affect orders already confirmed. An Express service is available at an additional cost of £45 per printed item. We will endeavour to produce your order within 5 full business days from the receipt of your written approval of the artwork. All Express orders require payment in advance of an order being placed. We will not be held responsible if the materials you require are not readily available. You will be advised of this at the time of ordering. Once we have received your 50% deposit we will produce artwork for your approval within two weeks. If you have chosen to use our Express Service we will produce artwork for your approval within three business days. We take great care in producing your artwork, but it is your responsibility for the accuracy of the copy you supply, and for proof – reading all text and copy we set out in the artwork. If you require any changes at this stage, you must let us know. You must make sure that the artwork and design is exactly as you want it before you approve it. The original artwork may be reasonably amended / refined once to achieve a suitable design. If artwork has been supplied according to your instructions to us, but you now wish to make subsequent changes, there will be a minimum reset charge of £15 per change. All changes must be supplied in writing. Telephone changes cannot be accepted. Any delay caused by you failing to respond to proofing items could mean a delay in your order. We will not begin production until we have received written approval of the artwork from you and payment in full. Telephone approval cannot be accepted as approval. We aim to produce your order within four weeks once we have received your written approval to the artwork submitted to you for approval NOT your written approval commissioning us to design for you. However due to the nature and complexity of some designs, we reserve the right to extend this to six weeks. It is your responsibility to ensure that you have adequate time prior to your posting date or event to allow for this. We are not responsible for materials required becoming unavailable, out of stock or on a long delivery which may delay production. If you have requested our calligraphy service or personalised printing service, it is your responsibility to provide accurate names and addresses and for the thorough checking of names and addresses once written or printed prior to posting. We will write / print exactly what you supply to us and in the order that you supply it in. We use Royal Mail delivery service and a national courier for dispatching orders (where local pick up is not an option). At the point of delivery you will be given the option as to select your preferred delivery method and charged accordingly. We are not responsible for non delivery, delays, missing or lost orders, missing invitations addressed to guests, or any failure of delivery of any kind once we have handed the item(s) to Royal Mail. All orders are suitably packed for transit in our studio and includes a delivery slip confirming the contents of your order. No responsibility is taken for damage to the outer packaging once it has left our studio or subsequent damage to any contents following damage to the outer packaging. Once your delivery has been signed for, any damage excluding our negligence in design or production, will be your responsibility. This includes any damage to your invitations or other wedding stationery when mailed to guests. We take great care on packing your stationery. In the unlikely event that your parcel suffers damage, you MUST write the word “damaged” when signing for the parcel. Failure to do so will impede any claim we make with the courier and will mean we cannot replace your items. You must report delivery damage to us immediately by email. It is your responsibility to ensure that your item being posted is of the correct weight and size for the postage applied. We would recommend that each item is weighed. All designs and artwork are copyright and property of Linda Abrahams & Co. You or a third party cannot copy any part of the design or reproduce it in any way. It is your responsibility to obtain permission to reproduce any copyright material such as images, hymns, poems which will feature in your stationery. Whilst we take every care possible during the production process, should any faults or damage occur as a result of damaged products used during the production process, Linda Abrahams & Co will reasonably replace any damaged items and be allowed a reasonable time to do this. Any replacement items will be produced as quickly as possible in a time of the essence manner. Linda Abrahams and Co will produce quantities as instructed by you, the client, at the time of ordering. It is your (the client) responsibility to check you have ordered sufficient quantities for the purpose you require. e.g If we have an order in production and are then given a guest list some time after placing your order, e.g. to enable calligraphy, Please note, WE DO NOT CROSS REFERENCE YOUR GUEST LIST WITH YOUR ORDER – it is your responsibility to order the amount you require to avoid any un-necessary re prints for which charges will be incurred. Designs that feature small parts and decorations are not suitable for small children or babies. Linda Abrahams & Co reserves the right to substitute alternative materials if a material becomes unavailable. You will be advised should any substitutions need to be implemented. Any substitutions made will not be detrimental to the design and will only be made in extreme circumstances. Due to the bespoke nature of our products slight variances may occur between each item. However, we make every effort to ensure that this is minimal and not detrimental to the design. Under the Data Protection Act 1998, all data collected is for the sole use of Linda Abrahams & Co and the Wedding and Event Store, Leeds and we will not use it in any other way unless required by law. We do not hold any credit card information once the transaction has been processed. MOCK – UP – e.g. 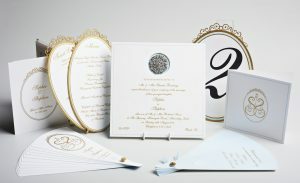 prior to production, an example mock up of the proposed finished invitation may on occasions be necessary to produce, this will be created and finished as near as possible to your chosen design, without actually producing your whole order. This mock up may not be printed, but will be made from your chosen materials, colours, embellishments etc. to demonstrate the finished design. Mock ups are not always necessary.